QuickDrag Firefox Add-On - Extend the power of drag-and-drop on websites ~ Android Forever! 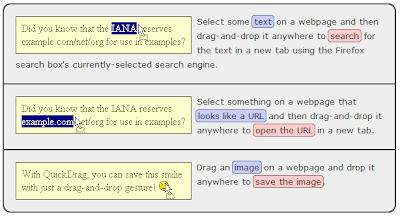 "Extends the function of the drag-and-drop mouse gesture so that it can be used to load URLs, do a web search of selected text on a page, or save an image on a page. The successor to Super DragAndGo."